BELL GARDENS — The Almont League football title will stay at Montebello High School. Ryan Rivera accounted for 435 yards and three touchdowns and the Oilers clinched a share of the league crown with a 49-32 victory at Bell Gardens. Andy Brown had 127 yards receiving for Montebello, which is league champions for the third consecutive season. The Oilers, ranked No. 3 in CIF Southern Section Mid-Valley Division, improved to 8-1 overall and 4-0 in league play. 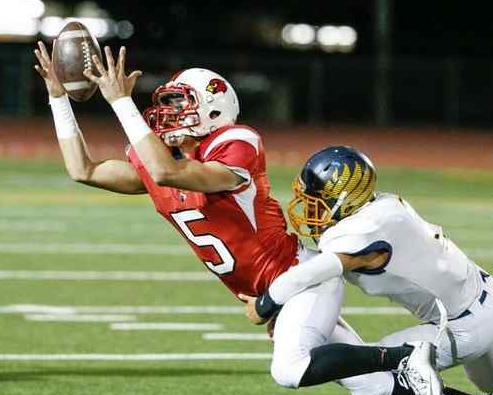 Jordan Cardenas threw for 216 yards and three scores for Bell Gardens, which dropped into third place at 5-4 and 2-2. Montebello scored on four of its last five first-half possessions to lead, 27-26, at halftime. Rivera threw for 275 yards in the first half to help the Oilers rally back from deficits of 14-3, 20-10 and 26-17. LA CAÑADA — After losing its first two Angelus League games of the season, the St. Francis High School football team wants nothing more than to see chaos ensue in the league standings. The Knights did their part to make sure exactly that happens by posting a 24-7 win over visiting St. Paul on Friday night. The league standings are now a jumbled mess. St. Francis’ win is partly why, but also Harvard-Westlake’s loss to Cathedral on Friday. The Knights improved to 6-3 overall and 2-2 in league. With a win next week over La Salle in the season finale, St. Francis can feel pretty confident it will make the CIF-SS Southeast Division playoffs. But exactly where remains a mystery thanks to results like Friday. St. Paul fell to 5-4 overall and 2-2 in league. The Swordsmen entered Friday tied with Cathedral for second place. St. Paul will likely need a win over Cathedral next week to guarantee itself a playoff spot. If not, the Swordsmen will be angling for the division’s lone at-large berth. League title with a 42-13 victory over host Santa Fe on Friday night at Pioneer High School. off 28 unanswered points in the first half and never looked back to run its record to 7-2 overall and 4-0 in league. The Chiefs fell to 4-5 overall and 3-1 in league. 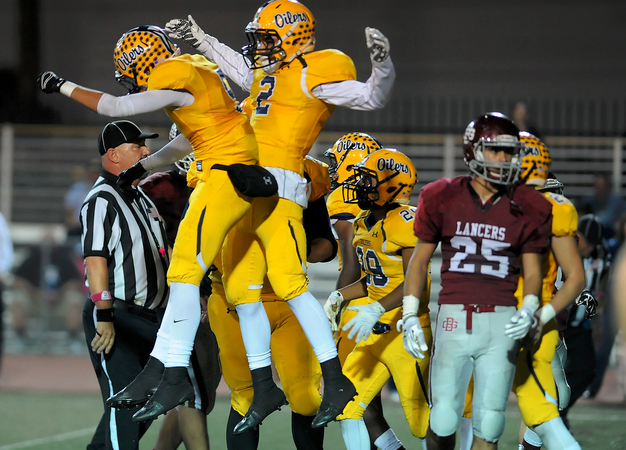 Right now, La Mirada High School owns the Suburban League. In what was expected to be a close league championship showdown, the Matadors took it to Mayfair to clinch at least a share of the league crown with a 52-7 victory on Friday night. It was close for one quarter. Sai-j Lauago rushed for 106 yards and three scores. Quarterback Tristan Meyer completed 14 of 19 passes for 154 yards and a TD. The Titans rallied from a 20-point deficit, scoring with 4:01 left in the Del Rio League game to break a 33-33 tie and keep their playoff hopes alive. Phillip Hernandez threw a 9-yard TD pass to Leonard Santangelo to break the tie. The Dons then marched the ball down to the Pioneer 10, but after a holding penalty, an interception ended the game. Hernandez threw three TD passes in the 20-point second-half rally for Pioneer (7-2, 2-2). El Rancho (0-9, 0-4) led 33-13 with with 4:30 to go in the third quarter. 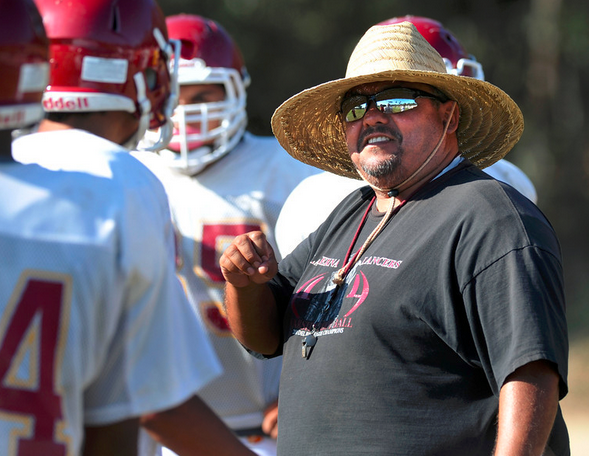 WHITTIER — Don’t count out Whittier High School from the CIF Southern Section football playoffs just yet. The Cardinals showed Thursday their hopes are alive and well. Dylan Salcido accounted for 288 yards and scored on a 5-yard run with less than five minutes to play to lead the Cardinals to a 32-28 victory over California in a Del Rio League game at Pioneer High School. Michael Arredondo rushed for 93 yards and two touchdowns for Whittier, which is alone in third place and the coveted final playoff spot at 5-4 overall and 2-2 in league play. Pioneer (6-2, 1-2), which is at El Rancho tonight, can join the Cardinals with a win. Cal, getting 125 yards passing and two touchdowns from Evan Barajas, slipped to 2-7 and 1-3. The Condors have lost three consecutive games since opening league play with a win over Pioneer. Whittier, which was chasing Cal all night, finally broke through late. The Cardinals, after falling behind 28-20 on Robert Leos’ 1-yard run in the third quarter, pulled within two at 28-26 on a 36-yard run by Arredondo with 9:19 left in the fourth quarter. Whittier then stopped Cal on a fourth-and-1 at the Condors’ 49 before driving to the winning score. Salcido had a key 22-yard pass to Rodrigo Pastrano to the 24 before he scored on a third-down run from the 5 for the 32-28 lead with 3:58 left. Cal drove inside the Whittier 35 with less than a minute left, but gave it up on downs following three incomplete passes, the final one on fourth-and-10 from the 34. Whittier then ran out the clock. Cal led 21-20 at halftime. WHITTIER — The District Attorney’s Office declined to file charges against a special education teacher and former football coach at La Serna High School who allegedly got into a physical confrontation with a special needs student, officials confirmed Wednesday.Shiara Davila-Morales, spokeswoman for the District Attorney’s Office, said the case was declined on Oct. 19 for insufficient evidence. The prosecutor didn’t charge Margarito Beltran Jr with misdemeanor cruelty to a child by inflicting injury. WHITTIER — La Serna High School has been the dominant girls volleyball team in the Del Rio League in recent seasons, and that trend is continuing this season. Isabelle von Lockner had 14 kills and Laura Butler had nine as the Lancers clinched the league title with a 25-16, 25-17, 15-25, 25-19 victory Tuesday at rival California..
Sierra Silvas had seven kills for La Serna, which improved to 19-5 overall and 8-0 in the Del Rio League. Maya Martinez had 17 kills for the Condors, who slipped to 11-8 and 5-3. The Lancers, who are 28-0 in league play dating back to 2013, trailed in every set, but came up big down the stretch. They rallied form a 5-3 deficit in the clincher in set four with an 8-3 surge for a 11-8 lead before closing with a 9-3 run to win the match. Celine Minasian had back-to-back aces for a 20-17 edge before von Lockner followed with consecutive kills to push it to 22-19. Butler closed with two kills to win it, 25-19.